You'll be £4.99 closer to your next £10.00 credit when you purchase Orde Wingate. What's this? Winston Churchill described Wingate as a 'man of genius who might well have become a man of destiny'. Tragically, he died in an jungle aircraft crash in 1944. Like his famous kinsman Lawrence of Arabia, Wingate was renowned for being an unorthodox soldier, inclined to reject received patterns of military thought. He was a fundamentalist Christian with a biblical certainty in himself and his mission. He is best-remembered as the charismatic and abrasive leader of the Chindits. With the support of Wavell, he was responsible for a strategy of using independent groups deep behind enemy limes, supported only by air drops. Wingate was responsible for leading the charge of 2,000 Ethiopians and the Sudan Defence Force into Italian-occupied Abyssinia. Remarkably, he defeated a 40,000 strong enemy that was supported by aircraft and artillery, which Wingate did not possess. Despite his achievements, Wingate suffered from illness and depression and in Cairo attempted suicide. He was not universally liked: his romantic Zionism contrasted with the traditional British Arabist notions. He did, however, lead from the front and marched, ate and slept with his men. In this authoritative biography, Royle expertly brings to life a ruthless, complex, arrogant – but ultimately admirable – general. Trevor Royle is an author and broadcaster specialising in the history of war and empire, with more than 30 books to his credit. His latest book is The Road to Bosworth, a study of the War of the Roses. He is a columnist for the Sunday Herald and is an Honorary Fellow at Edinburgh University's School of History. He was born in India in 1945. Orde Wingate was a lauded and controversial officer,forever associated with his Chindit force in the jungles of Burma in WW2. Even now his personal and military legacy can be nearly as decisive as Haig and the First World War.An innovative genius achieving results out of all proportion,or a madman profligate with scarce ives and scarcer material?Both arguments have been made. 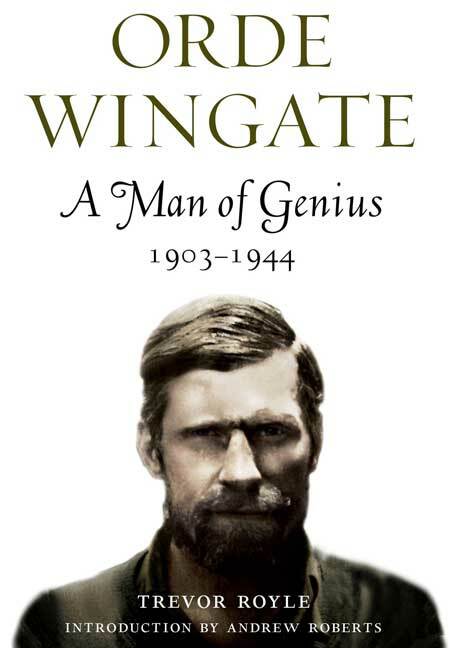 Frontline's reissue of Trevor Royle's 1995 biography"Orde Wingate:A Man of Genius"(355pp£16.99)perhaps gives us an indication from the get-go(it was perhaps better subtitled'Irregular Soldier'on origianl publication) but of the vast literature this stands out as one of the best.Well worth acquiring if you do not have the earlier addition. Wingate has a tendency to appear out of nowhere in books on the Burma campaign, or after a brief summary of his career in books on the Chindits, so it's very valuable to learn in more detail about his previous career. The sections on the Special Night Squads in Palestine in the immediate pre-war period and on his part in the liberation of Abyssinia are of particular interest, helping to show how his theories on irregular warfare and long range penetration raids developed. Royle has produced a well-balanced biography of Wingate, attempting to look at both sides of the case in many of Wingate's bigger arguments with his superiors, and often finding good arguments on both sides (something Wingate himself rarely seems to have done!). The result is a superb biography. As something of a Maverick, who was - some people argue - bordering on insane, Wingate was seen as something of a loose cannon by his superiors, especially due to his often scathing criticism of fellow officers, and the fact his tactics often lead to great numbers of casualties amongst his own men. However, he did nonetheless orchestrate some impressive offensives, and this biography does much to restore the reputation of his martial prowess. Renowned for being an unorthodox soldier, and inclined to ignore more conventional patterns of military thought, Winston Churchill once described Wingate as "a man of genius who might well have become a man of destiny". In this biography, Trevor Royle brings to life the actions of this complex, but ultimately admirable, general. Royle's book is an insightful look at the controversies which have dogged Wingate's reputation over the years. All in all this book is strongly recommended to anyone interested in irregular warfare and counterinsurgency operations. A lucid and convincing account.